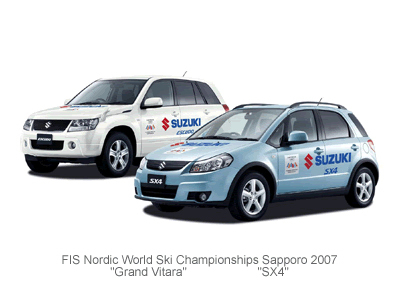 Suzuki Motor Corporation will sponsor FIS Nordic World Ski Championships that will be held in Sapporo, Japan from February 2007. The Nordic World Ski Championships have been held every two years by "International Ski Federation" (FIS － Headquarter: Switzerland), competing in technique and speed by the top skiers who have won the preliminary competitions in their countries. This Sapporo Championship is the first one ever holding in Asia, and world first to organize some competitions in indoor stadium (Sapporo Dome). Suzuki will support this championship as a main sponsor and provide the total of 50 units of "Grand Vitara" (Japan name: Escudo) and "SX4". "Ski Jumping" － Compete the flying distance and the flying form. "Cross Country" － Compete the time of skiing up-down hills. "Nordic Combined" － Combined competition of above two.